A household name like Gibson hardly needs introducing to the musical community. As a whole, the history of Gibson Guitars dates back as far as 120 years. Thanks to legends like Clapton and Slash, everyone has undoubtedly seen a Les Paul electric guitar, but what about Gibson Acoustic Guitars History? The year is 1894 and Orville Gibson has just created the earliest documented Gibson instrument: a mandolin based on the arch-top design common to violins. Young Orville continues, working out of a one-man woodworking shop in Kalamazoo, Michigan, to produce a brand-new family of mandolins and acoustic guitars. All feature the same arch-top design. In fact, Gibson is often credited with inventing the arch-top guitar. A demand for Orville Gibson’s instruments quickly begins to overwhelm the talented craftsman. In 1902, in accordance with five financiers (music-store owners and lawyers) in Kalamazoo, Orville sells his name and forms an agreement to found the Gibson Mandolin-Guitar Manufacturing Company. He remains with the company as a consultant up until 1904. Gibson’s arch-top acoustic guitars prove popular on into the 1920’s and 30’s. While the arch-top remains quintessential to “Spanish” style players, dance bands, swing orchestras and Western outfits, the decade gives way to flat-top acoustic guitars and other manufacturers were already making waves in the new market. Around the late 1910’s, Gibson releases its first line of flat-tops, an “Army-Navy” model guitar aimed primarily at servicemen toward the end of World War 1. The guitar is marketed as highly “affordable” and will become but a footnote in the company’s vast history of innovation. After a number of hospital stays, on August 19th, 1918, Orville Gibson, the company’s founder, dies at the age of 62. From 1908 until his death, Gibson was paid the modern equivalent of $20,000 every month. In 1921, Gibson employee Ted McHugh designs the first adjustable truss rod and a height-adjustable bridge. Then, in 1922, sound engineer Lloyd Loar develops the F-5 mandolin, in a bid to revive public demand for the instrument. To this day, folk and country players regard the F-5 as the finest instrument ever made. The L-5 acoustic guitar is originally included as the largest member of Loar’s new mandolin family but soon distinguishes itself as Gibson’s first “modern” acoustic guitar. While the popularity of flat-top acoustic guitars rises, Gibson produces its first proper flat-top by the end of the 1920’s. In 1926, the small and simple L-1 model ships out for sale. When flat-top guitars prove to be a viable product, Gibson signs the first star of recorded guitar, Nick Lucas, as a signature artist. The Nick Lucas model features the same body as the L-1 but caters more for sound and accessibility. 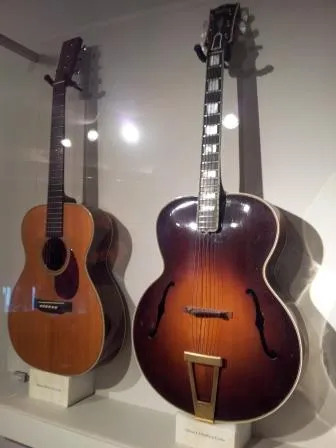 By 1933, just before the company debuts its very first electric guitar, Gibson introduces several larger, deep-bodied flat-top acoustic guitars. While arch-tops remained their flagship leaders, flat-top guitars become cemented into the brand’s catalogue. The company struggles to survive the late 1930’s. During the Great Depression, Gibson focuses primarily on selling extremely cheap guitars out of Kalamazoo, wooden toys, and crafting new designs. The year 1934 sees competition between Gibson and the up-and-coming instrument manufacturer, Epiphone. In an attempt to defeat its competitors, Gibson “advances” the bodies, ranges and volumes of its many arch-top guitars and announces a new venture into the flat-top market: the round-shouldered dreadnought shaped Jumbo model. The first Jumbo is improved upon and replaced by both the J-35 and the Advanced Jumbo, in 1936. In the meantime, Gibson continues to enjoy success with the L-1, L-0, and L-00 flat-top models. Arguably the most impressive flat-top of the era came about in 1937 when “cowboy” star Ray Whitley ordered a custom acoustic guitar from Gibson. The Super Jumbo, or J-200, is born. This super-large guitar will go on to become a status symbol for players familiar with the Grande Ole Opry and various Country and Western circuits. 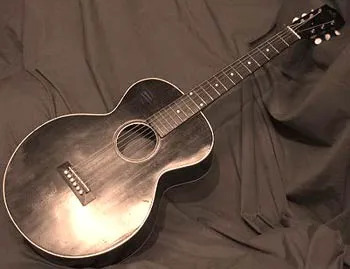 Although Gibson’s production is significantly hindered by World War 2, several new models are introduced, such as the Southern Jumbo acoustic guitar. A shortage of steel forces the company to build guitars without truss-rods and incidentally marked a transition in popularity from arch-top guitars to flat-tops. With a postwar boom in the demand of musical instruments on the horizon, the Chicago Musical Instrument Company buys Gibson. Further innovation is heavily implemented over the following years. In 1952 Gibson recruits recording artist, Les Paul to launch what is considered by many as the brand’s most popular guitar. The “Les Paul Model” hits the electric guitar world to critical appraise and is widely renowned to this day. While its competitors center around the folk boom of the 50’s and early 1960’s, Gibson takes a different route and, instead, produces upgraded versions of previously released models. During this period, consumers often claim Gibson’s design choices to be pointless or counterproductive. Changes include a height-adjustable bridge fitted onto the company’s flat-tops. Gibson once again undergoes new ownership in 1971. The Ecuadorian Company Ltd, or later known as Norlin, begins to slowly move the company out of Kalamazoo, Michigan and into Nashville, Tennessee, and by 1984, production of Gibson instruments leaves Kalamazoo entirely. The company starts to see difficulties and soon begins dying, however, in 1987, Gibson opens a new plant in Bozeman, Montana. Production in Nashville is shifted exclusively to that of electric guitars while the plant in Montana focuses on producing F-5 style mandolins. Mandolins manufactured in Bozeman go above and beyond current quality standards. The skilled team of luthiers are praised for their achievements, however, demand for the flat-top guitar skyrockets above that of mandolins. Taking the Montana plant’s knack for acoustic instruments into account, Gibson begins moving flat-top production to Bozeman while assigning Nashville to mandolin production. From 1989 to present day, the plant strives to create flat-top Gibson guitars of the highest quality. 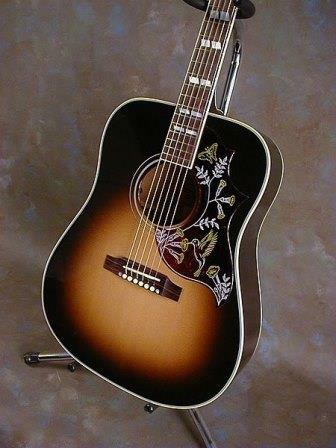 Gibson never ceases to produce some of the cleanest, deepest, full-toned acoustic guitars going around. Today, the company boasts a multitude of signature series models, entry to advanced level guitars and even acoustic guitars that can tune themselves! With over 120 years of innovation, the history of Gibson acoustic guitars is always expanding. There is a reason Bob Dylan, Elvis Presley and virtually all of the greats have sworn by the Gibson name.